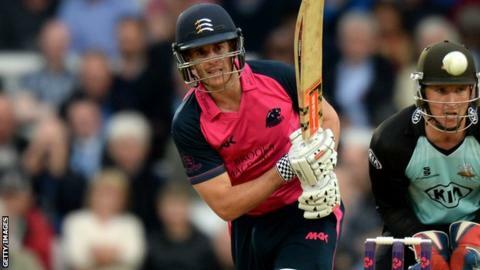 Middlesex all-rounder Neil Dexter has signed a new contract with the club, which will keep him at Lord's until the end of the 2015 season. The 30-year-old has scored over 6,600 runs and taken 137 wickets since joining Middlesex from Kent in 2009. "Neil is the sort of cricketer every club wants on their staff," managing director of cricket Angus Fraser said. "He plays and contributes in all three forms of the game. He has many good years of cricket left in him." He added: "I hope those are spent at Middlesex." Dexter captained Middlesex in all forms of the game between 2010 and mid-2012, when he relinquished leadership in the four-day game and was replaced by Chris Rogers. He remained skipper in one-day competition until the end of last season, when England batsman Eoin Morgan took on the role. Prior to this week's County Championship game against Durham, Dexter had scored 457 Championship runs this season at an average of 32.64 and taken 15 wickets. He recorded career-best bowling figures of 6-63 in the first innings against Lancashire in May this year.